The flavour combination of this sauce is the perfect complement to these delicious skillet pork chops. This simple recipe is sure to become your new go-to favourite. Heat oil in large ovenproof skillet on medium heat. Add onions; cook 5 min. or until crisp-tender, stirring frequently. Increase temperature to medium-high. Add peppers; cook 2 to 3 min. or until crisp-tender, stirring frequently. Stir in vinegar; cook 1 to 2 min. or until vinegar is cooked off, stirring frequently. Spoon vegetables into bowl; cover to keep warm. Place flour in pie plate. Add chops, 1 at a time, turning to evenly coat both sides of each chop with flour. Add to skillet; cook 5 min. or until chops are evenly browned on both sides, turning after 3 min. Remove from heat. 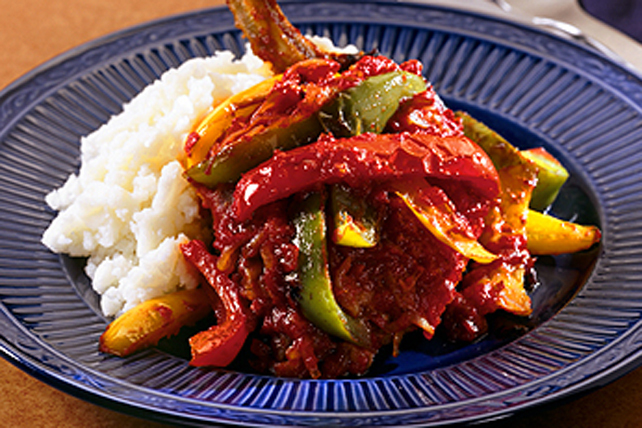 Spoon vegetables over chops; top with chili sauce. Cover. Bake 1 hour or until chops are tender. Prepare using 4 bone-in chicken breasts (2 lb./900 g), decreasing the baking time as necessary until chicken is done (165ºF).